PT Garuda Indonesia (Persero) Tbk - Garuda Indonesia or referred to as "Garuda Indonesia Group" is an Indonesia state-owned company with a core business in airline industry. The majority of Garuda Indonesia Group’s shares - listed on the Indonesia Stock Exchange (IDX) under reference GIAA - is owned by the Government of Indonesia with 60.5% shares ownership. Other 39.5% remaining shares in Garuda Indonesia Group was owned by Credit Suisse AG Singapore TR AC CL - PT Trans Airways (24.6%) and public (14.9%). Garuda Indonesia Group is based in Soekarno–Hatta International Airport Cengkareng (near Jakarta) and now has 180 fleets (as at the end of August 2015). Its fleets include 137 Garuda's main board fleets, and 43 Citilink's fleets. 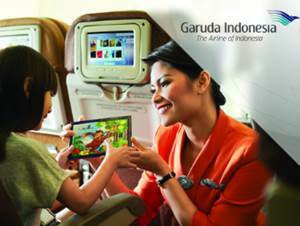 Garuda Indonesia Group is recognized as a world class airlines company. On 12 December 2014, Garuda Indonesia named as the 5-Star Airlines by Skytrax, the leading airline and airport review specialists in the world. In term of financial performance, Garuda Indonesia Group has shown significant performance improvements. Garuda Indonesia Group successfully obtained total profit for the current year (2015) at US$ 77.97 millions as compared with loss US$ 368.91 million in the previous year, according to PT Garuda Indonesia (Persero) Tbk Annual Report 2015 as cited by JobsCDC.com. Female, Single/not married with minimum age of 18 years and maximum age of 27 old for fresh graduate candidates or 33 years old for candidates with previous experience as a flight attendant. Good looking, minimum height of 158 cm and maximum 172 cm with ideal weight and body posture proportional. Minimum education background in Senior/Vocational High School (SMA/SMK) or equivalent, Diploma Degree (D3) or above is preferred. Should you are interested and qualified, please register directly through Garuda Indonesia's linked e-Recruitment website http://career.garuda-indonesia.com (please register first if you don't have an account). And then submit your application directly through walk in interview that will be held on 20 July 2016 (08.00 - 11.00 WIB) at Auditorium Gedung Manajemen - Garuda City, Jl M1 Area Perkantoran Bandara Internasional Soekarno-Hatta Cengkareng. JobsCDC.com now available on android device. Download now on Google Play here. Please be aware of recruitment fraud. The entire stage of this selection process is free of charge. PT Garuda Indonesia (Persero) Tbk - Walk in Interview Regular FA Garuda July 2016 will never ask for fees or upfront payments for any purposes during the recruitment process such as transportation and accommodation.